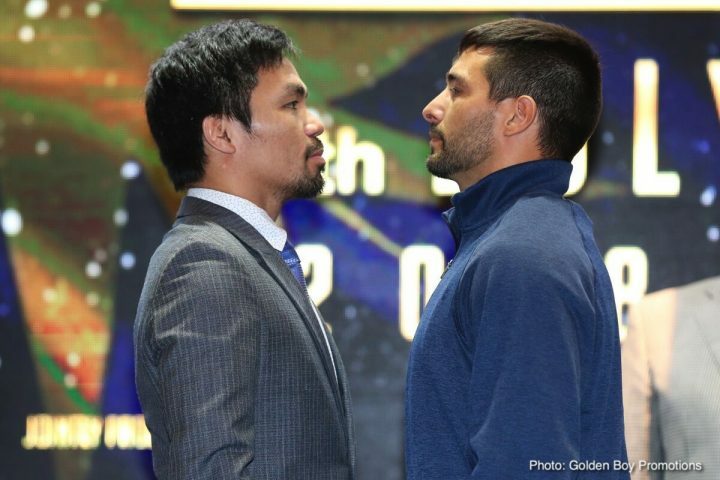 By Chris Williams: Lucas Matthysse says he’s looking forward to his fight against Manny Pacquiao on July 15, and he expects the Filipino dynamo to be as good as he ever has been. Matthysse (39-4, 36 KOs) will be making his first defense of his World Boxing Association World welterweight title against the 39-year-old Pacquiao (59-7-2, 38 KOs) at the Axiata Arena in Kuala Lumpur, Malaysia. Pacquiao’s career is on the line against Matthysse. Another loss for the Filipino star and it’s over with for him. Matthysse usually knocks his opponents out, so Pacquiao is facing a guy that can send him into retirement on July 15. Matthysse is arguably the weakest link among the welterweight champions, but he’s one of the most dangerous because of his power. For an old timer like Pacquiao, Matthysse could be the straw that broke the camel’s back. It’ll be time for Pacquiao to head off into the sunset if he loses this fight. Pacquiao’s career has already imploded. Top Rank suggesting that he fight on the undercard of Jeff Horn vs. Terence Crawford was a major hint that Pacquiao is finished. Matthysse is the biggest puncher Pacquiao has fought in at least 9 years since his fight against Miguel Cotto. Pacquiao now no longer has his blazing hand speed and his quick reflexes to keep him out of harm’s way. If Pacquiao is going to win this fight, he’s going to need to take Matthysse’s bet shots for a number of rounds for him to last long enough to beat him by a decision. You can rule out Pacquiao knocking out Matthysse because he hasn’t knocked anyone out in nine years since his 12th round knockout victory over Miguel Cotto in their catch-weight fight in 2009. Pacquiao’s punching power abandoned him overnight after his TKO win over Cotto. Matthysse, 35, won the vacant WBA World welterweight title on January 27 after beating #1 WBA Tewa Kiram (38-1, 28 KOs) by an 8th round knockout. The WBA sanctioned the Matthysse-Kiram fight for their vacant WBA ‘regular’ welterweight title. Kiram had zero experience against world class competition during his career, and the WBA probably should have never given him a No.1 ranking or sanctioned the fight to be for their secondary WBA 147lb title. With Pacquiao having lost his last fight against Jeff Horn by a 12 round unanimous decision on July 2 last year, he probably doesn’t deserve to be ranked #1 by the WBA. In light of Pacquiao’s loss to Horn and the 12 months of inactivity, he hardly deserves to be ranked No.1 with the WBA. Sanctioning bodies obviously have their reasons for ranking fighters, but in the case of Pacquiao, they seemed to have given him a very generous ranking based on things he’s done in the past rather than lately. Pacquiao hasn’t won a fight in 1 ½ years since his 12 round unanimous decision victory over Jessie Vargas in November 2016. That was a long time ago. Pacquiao receiving a No.1 ranking based on his last win taking place almost 2 years ago makes the WBA look bad for giving him that ranking. Pacquiao isn’t the same fighter he once was. Matthysse is giving him too much respect fat this point. Pacquiao has looked steadily worse since 2012, when he lost to Tim Bradley and Juan Manuel Marquez. Pacquiao has won some fights since then in beating Bradley twice, Chris Algieri, Brandon Rios, and Jessie Vargas. That’s it. Those are the only guys that Pacquiao has beaten. He lost to Jeff Horn and Floyd Mayweather Jr.
Top Rank, the promoters for Pacquiao though those years, hasn’t put him in with the top fighters from current era of welterweights, such as Errol Spence Jr., Keith Thurman, Danny Garcia, Shawn Porter and Terence Crawford. If Pacquiao wasn’t now making the decisions for himself, he probably would never get a fight against any of those guys. In fact, I don’t see Pacquiao ever making the choice of mixing it up with any of those fighters. t this point, Pacquiao is likely going to retire if he loses to Matthysse. If Pacqiuiao gets past Matthysse on July 15, he’ll probably face lightweight Vasyl Lomachenko in his next fight. What would be a real embarrassment is if Pacqiuiao beats Matthysse to capture the WBA ‘regular’ welterweight title, and then he defends the belt against Lomachenko, who would have to move up 2 weight divisions to take the fight. I would make a joke out of the WBA’s welterweight title for Pacquiao to defend against Lomachenko, who has never fought in the 147lb weight division before. Matthysse is now trained by Joel Diaz in the U.S. Matthysse would have a good chance of beating Pacquiao no matter who trains him for this fight. Pacquiao’s stamina and his killer instinct no longer seem present. Last year he had Horn ready to be knocked out in the 9th round, and he couldn’t do it. Pacquiao didn’t even try to finish Horn off in the 10th despite being asked by his former trainer Freddie Roach to go after the Australian fighter. Pacquiao couldn’t do it. A year later after sitting around and not fighting, Pacquiao is going to have even less of a chance of winning this fight. Matthysse is a better fighter than Horn in terms of offensive skills and punching power. The only things that Horn has that Matthysse doesn’t are junior middleweight size, and his roughhouse style of fighting, which he got away with last July against Pacquiao. “We’re focused very much on this fight, and people will see the same Lucas Matthysse as always, the one who always looks for the action,” Matthysse said. ”It’s a fight that I like because of our similar styles and because we are of the same height. I had known Joel Diaz for some time already, so I decided to start my career again with him in the United States,” Matthysse said.